This project ended successfully on 22/4/2017 15:00! A keychain bottle-opener with the logo and two stickers La Meute. Lovely ! You’re gonna be able to open your Narvale at all times ! A tote bag with the La Meute logo, printed with linocut technique 100 metres away from the brewery. Design engraved by Robin Lopez. Koqa Beatbox CD + 1 beer. Smashing! You’re gonna get the last album from the buddies from Koqa Beatbox «Nor Will Ever Be». A voucher for a beer will be in the envelope as well. A voucher for a 4 beer pack and a keychain bottle-opener. Bam! Now you’re truly ready for all situations ! A3 poster with the La Meute logo. Linocut on paper designed by Robin Lopez in A3 format. And a voucher for a beer of course. Linocut paintings of our labels. Brilliant! You’ll have the choice between the four different designs inspired by our labels. You’ll be able to choose the paper and ink color as well. Sweet stuff for your living room engraved by Boris Gigon. Koqa Beatbox LP + 1 beer. You like good sound and want the latest album from Koqa Beatbox ? Perfect, you’ll receive the vinyl and a voucher for a beer! A black t-shirt La Meute. Now you can show off while drinking a Kratz this summer. Screen printed 100 metres from the brewery at the «X Personnes» workshop. The fanboy’s kit! Now you got it all and we like it! We send you all the following : bottle-opener, tote bag, t-shirt, and a voucher for each of the four beers (Kratz, Ribs, Narvale, Phacochère) and some stickers. The fanboy’s kit ++ Alright! We’re adding the « La Meute » A3 logo printed with linocut technique to the fanboy’s kit! You’re already getting the bottle-opener, the tote bag, the t-shirt, a voucher for each of the four beers (Kratz, Ribs, Narvale, Phacochère) and some stickers! Unique aquarelle «La Ribs». Yeah! You’ll get the original version in 50x20cm format painted by Sullivan Barbezat. With a voucher for a beer included. Unique aquarelle «La Narvale». Yeah! You’ll get the original version in 50x20cm format painted by Sullivan Barbezat. With a voucher for a beer included. Unique aquarelle «La Phacochère».Yeah! You’ll get the original version in 50x20cm format painted by Ormis. With a voucher for a beer included. Unique aquarelle «La Kratz». Yeah! You’ll get the original version in 50x20cm format painted by Sullivan Barbezat. With a voucher for a beer included. Come brew with us! You’re curious about the whole brewing process, learn some stuff and drink some beers ? Great! We welcome you at the brewery for a day of brewing, and then for the bottling and tasting. You can even take two friends with you. Ultimate fanboy’s kit! Wow you can’t miss that one!! You get here two special art piece! The A3 « La Meute » logo and a linocut painting of our labels! For the later, you’ll have the choice between the four design inspired by our labels (paper and ink colour). And of course, adding to that, you get the bottle-opener, the tote bag, the t-shirt, a voucher for each of the four beers (Kratz, Ribs, Narvale, Phacochère) and some stickers! A tasting for two each two months at the brewery! You’ll be informed about our latest creations and we invite you each two months for a year to drink some beers with us. The tasting dates will be fixed in advance and we’ll organize some appetizers too. Beer package! Each two months for a year, you’ll get a sixpack with beers of the moment. If you live in a 10km radius from the brewery, we deliver it to you by bycicle. Otherwise you have to get it at our place. A 20 litres batch! Wow, you’re thirsty and there’s a beer of ours you like ? You’ll get a newsletter with our latest creations, and if a beer catches your eye you can order a 20 litres batch. We put this in bottles and deliver it to you if you live in a 20km radius. If you’re living elsewhere you’ll have to get it at the brewery. Group visit! Come to chill with your friends or colleagues, 20 people at most, and take a tour through the brewery followed by a tasting of the latest beers. There’s gonna be some food too. Beer package ++! Each month you’ll get a sixpack with beers of the moment. If you live in a 10km radius, we deliver it to you. If not, you’ll have to stop by to get it. Learn to brew and go home with the beer! Want to try how to brew ? We are looking forward to show you how it’s done on a small setup. After a few weeks you can come get 30 litres of the beer you made with us! Order your own personal batch! Tell us your fantasies and we try to brew a beer especially just for you. 30 litres you can get at our place after a few weeks. You can come to assist the brewing process, but it’s not mandatory. We come at your place and you enjoy! Are you strong enough to get to know our beers? That’s great! Well in that case, we come by with loads of ours specials beers and give you a private tasting for max. 50 person. Private party at the brewery! Ow yeah! With this we organize a little private party at our place for 20 people. Music, good vibes, an original beer based dish and most importantly : OPEN BAR! One 24 crate beer delivery! That’s right, you get one beer crate every month at your door for a whole year!! You can even choose between the Narvle and the Kratz for each delivery. We deliver in a 40km radius. 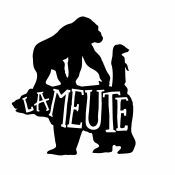 The brewery La Meute gathers three friends who decided to break out of their kitchen to start a crazy project in an old tinware workshop in La Chaux-de-Fonds. Helped by their friends to carry out a part of the renovations, the premises now allow them to brew some beer, splendid ! The big adventure of the pack is officially on the road !